August 20, 2015, 7:14 p.m.
One of the major points of debate in the Democratic primary has been the growing cost of college tuition, even at state schools. The average in-state tuition was just over $9,000 in 2015, a 225% increase since 1985. Hillary Clinton announced a $350bn plan to increased federal funding for grants, states and colleges to make sure no student or family has to borrow money to pay for in-state tuition. Her main opponent, Bernie Sanders, has gone a step further and called for tuition fees at public colleges to be abolished and replaced by state funding. YouGov&apos;s latest research shows that when Americans are asked about the core idea behind Hillary Clinton&apos;s college plan, the idea that no one should borrow to pay tuition in state, a large majority of Americans (62%) agree with the idea. The plan is particularly popular among Democrats (82%) and independents (58%). 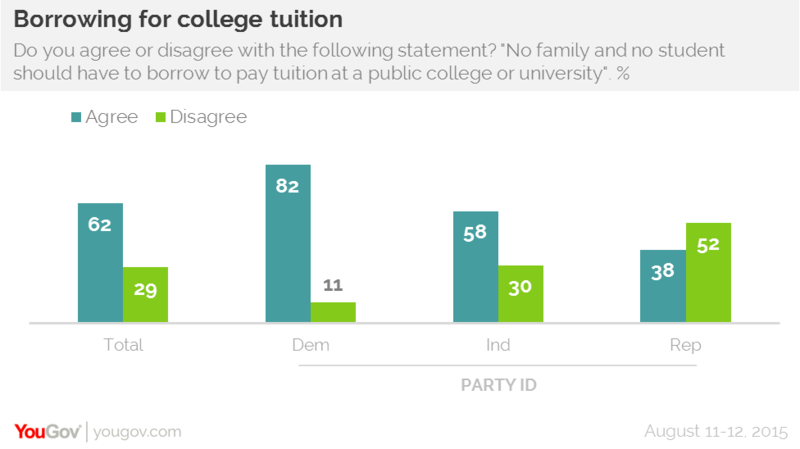 Most Republicans (52%) oppose the idea, but 38% of Republicans do think that families and students should have to become indebted to pay college tuition. Hillary&apos;s main opponent in the Democratic primaries, Vermont Senator Bernie Sanders, favors a more generous college plan that would make college tuition free for students at public schools. 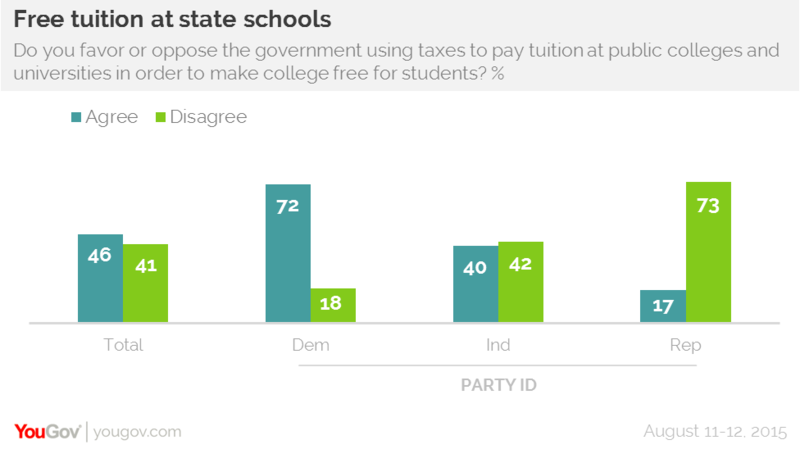 In principle 55% of Americans agree with free college tuition and 46% agree with using taxes to pay for students&apos; tuition fees. 41% of the public disagrees with the proposal, however, and attitudes are highly partisan. While 72% of Democrats support the idea, 73% of Republicans oppose it. Independents are divided 40% in favor to 42% again.